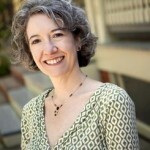 After reading this delightful piece written by returning guest blogger Diane McCormick, I promise you’ll never look at another keyhole the same. Central Pennsylvania Youth Ballet’s past “Nutcracker” Maries — Tina LeBlanc, Anna Gerberich, Julia Rowe, and Grace Anli Snyder — discuss with McCormick their peeks through the keyhole. Their journey. The take aways. Lessons learned. And, life now on the other side of that keyhole. To all Maries past and those yet to come, enjoy! The first time she played Marie in George Balanchine’s The Nutcracker™ for Central Pennsylvania Youth Ballet, Grace Anli Snyder loved the new dress made just for her. But in the scene where the children spy on the grown-ups preparing for Christmas, she was disappointed because she didn’t peek through a genuine keyhole. Snyder recovered from her disappointment. Her role as Marie in three CPYB productions, plus turns in major solos as she matured, prepared her for her spot today as an Alabama Ballet company member. In George Balanchine’s The Nutcracker™, Marie takes a magical journey awash in emotions – joy, awe, anger, delight, even heartache. It’s a journey that mirrors every girl’s passage from child to young woman. For CPYB dancers, playing the role of Marie also embraces their growth as dancers, as they step from stage struck little girls to featured dancers striving for the next challenge. The peek through the keyhole offers a glimpse of the dancing life, and even with the hard work and challenges ahead, they choose to step through and make it their own. For Anna Gerberich, CPYB’s 1998 and 1999 Marie and now a Charlotte Ballet principal dancer, the onstage peek through the keyhole with the dancer playing her brother, Fritz, was filled with anticipation. Charlotte Ballet principal dancer and CPYB alumna Anna Gerberich performing the role of Sugarplum Fairy. Photo courtesy of Charlotte Ballet. San Francisco Ballet corps de ballet member and CPYB alumna Julia Rowe in Helgi Tomasson’s “Caprice.” Photo courtesy of San Francisco Ballet. Photo courtesy San Francisco Ballet. 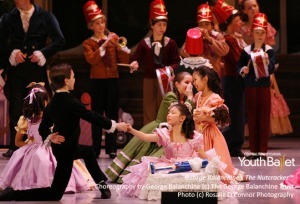 Every year, at CPYB and dance companies worldwide, performances of George Balanchine’s The Nutcracker™ constitute a passing of the torch, as young dancers first play angels, then get tapped to play Marie, and finally graduate to soloists. The glitter never drops from their eyes, but they look up to the older dancers and see that hard work will take them to the next level. 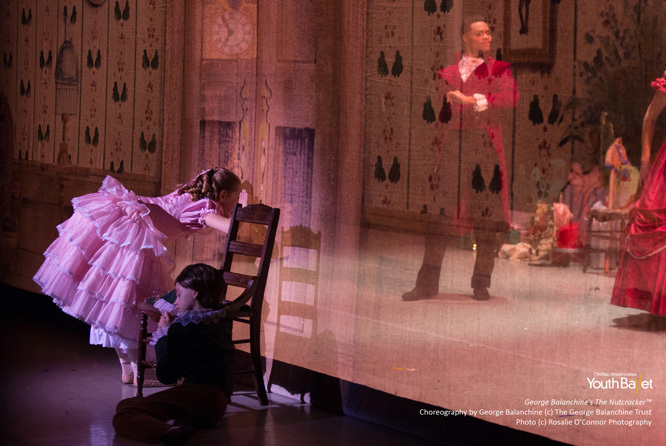 Current San Francisco Ballet faculty member, former SFBallet principal dancer, and CPYB alumna Tina LeBlanc and Gonzalo Garcia in Tomasson’s “Nutcracker.” Photo courtesy of San Francisco Ballet. Rowe now realizes, from her peek through the keyhole toward the professional life ahead, that her CPYB years were “similar to the environment I dance in now,” where the payoff for grueling rehearsals is the magic of performance. “You learn how to dance to your fullest not only for that year’s performance, but for the next year and the next,” Rowe say. Gerberich loves seeing the children getting ready to perform in Charlotte Ballet’s The Nutcracker every year. Rowe is still amazed to perform San Francisco’s Nutcracker every year. Better yet is the moment in the lobby after performances “when you see all the little girls and see their faces light up, and you remember why you’re doing what you’re doing.” She sees herself in those little girls, and they may someday follow in her pointe shoes.